Next Tuesday, March 26th, will be the final plenary vote on the Copyright in the Digital Single Market Directive. 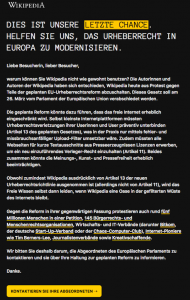 The focus has been on Articles 11 (press publishers’ right) and 13 (licensing obligation leading to upload filters), with demonstrations, petitions and blackouts, for example of the German, Czech, Danish and Slovak Wikipedia sites. This blog post will look at some of the lesser-known provisions of the proposed Directive (and what provisions we’ve lost and gained since the original Commission draft in 2016). The discussion is based on the final compromise text agreed on 13 February available here. At present, the legality of TDM activities in the EU is uncertain, in part due to the narrow construction of existing copyright exceptions under Article 5(3) of the InfoSoc Directive. In order to clarify the status of such activities, the new Directive proposes to explicitly except TDM activities from copyright infringement, in a hope to boost research into important areas such as Artificial Intelligence (AI). Right holders will be able to specifically object to TDM by other users through an “appropriate manner”, presumably e.g. by stating this in the terms and conditions of their website. This means the new exception is subject to contractual override. On that point, it is also uncertain whether Technical Prevention Measures (TPMs), currently legally-sanctioned, could be utilised to undermine this exception. The condition of “lawful access” means right holders may now begin to price the allowance of TDM activities into subscription fees, potentially increasing barriers for smaller companies to compete in this market. Bigger questions remain on the effect such a provision will have on the presumption of copyright subsistence in data, facts and information. The current TDM exception presumes such materials are protectable, which is contrary to the EU copyright acquis. This is a complicated set of rules for a provision seeking to answer a legal uncertainty. The new Directive proposes to harmonise and facilitate cross-border teaching practices, and the use of digital materials for teaching purposes, free from copyright concerns. Since the trilogue process however, the new exceptions granted in Article 4 have been described as “gutted”. According to the compromise text, the education exception can be overridden if the right holder makes a licence “easily available” in the market; importantly, this means teachers and students would have to accept the terms of the licence, even if they do not agree with them. Furthermore, Recital 16 now allows for Member States to differentiate on the amount of materials that can benefit from this exception, seemingly undermining the facilitation of cross-border teaching. Unlike the previously agreed Parliamentary position (at Recital 15) the new exception only applies to formal educational establishments, and does not include e.g. educational activities in museums or libraries. Many of these provisions have been heralded as a “win” for cultural heritage institutions and the public domain, beginning with Article 5 which creates a EU-wide exception for the preservation of materials (even if they’re in-copyright) by museums, libraries, archives etc. However, the exception under Article 7(1a) that permits cultural heritage institutions to make available out-of-commerce works for non-commercial purposes is immediately turned into a licensing mechanism. Under Article 7(1b) the new exception only applies if there is no collective management organisation offering a licence. A new Article 9a, which allows Member States to voluntarily introduce Extended Collective Licensing schemes has the potential to assist with mass-digitisation efforts. A new Article 10b also has been introduced, which denies copyright protection to reproductions of visual art that are already out of copyright. This will harmonise reuse of photographs of certain public domain materials across the EU, where otherwise the reproduction of such works may attract neighbouring rights in certain countries. The provision is limited to “works of visual art” only – a term which is undefined. Whilst some have welcomed this addition, others have criticised it as jeopardising important sources of revenue for cultural heritage institutions. Articles 14 – 16 aim at improving the position of individual authors by preventing unfair licensing practices and forced “buy out” contracts. This has been bolstered by creating new provisions on contract transparency and adjustments (to ascertain and return appropriate amounts of remuneration) and revocation of licences or transfers where there is a lack of exploitation of a work. Regarding a general “Principle of appropriate and proportionate remuneration” introduced as Article -14, Recital 39y of the final compromise now clarifies that “lump sum” payments can constitute acceptable remuneration. So potentially exploitative total buy-out contracts appear to remain possible (limiting the possibility of claiming additional payments under the contract adjustment provisions of Article 15). What got dropped along the way? Sports Organisers’ Right – The negotiation mandate approved by the European Parliament in September 2018 included a new Article 12a providing for a sport event organisers’ exclusive right to record events and make them available through publication, broadcast etc. This right would apply in addition to the existing “related right” for broadcasters, and was said to be targeted at clips used by betting sites. Since no Impact assessment was conducted about this provision, academics had recommended rejection at our September intervention. The provision has now been abandoned and is absent from the final compromise text. Freedom of Panorama – Despite many calls to harmonise freedom of panorama (i.e. permission to take photographs of copyright works located in public spaces) this has not been adopted in the final compromise text (having been supported as part of the Parliament’s vote on the Reda report in 2015 and briefly re-appearing as Article 5a of a JURI report in 2018). Is it possible to have an independent, evidence based position in this debate?